When we think about the intersection of sports and fashion, most often we think of the newly popular “athleisure,” yoga pants, maybe a jersey for a favorite football team. The blazer isn’t typically a part of this group, but rather it’s a modern staple of the menswear community—to be worn in the office, out on the town, in a casual setting, or really anywhere. What many don’t know is that the blazer emerged in the fashion landscape hand in hand with athletics—rowing, to be specific. Jack Carlson has a rich history with the sport of rowing, which would eventually lead him to the inception of his clothing company, Rowing Blazers. But to backtrack to 2004, Carlson recalls competing at Henley Royal Regatta, one of the most prestigious and traditional competitions in the sport. After being eliminated in the first round, Carlson says, “This left me with a lot of time in the spectator area. I got to spend a lot of time chatting with other rowers from all over the world and hearing some of the quirky stories, traditions, myths, and rituals about their club blazers. The blazer is a big tradition in the sport of rowing, and every country, every club, has their own colorful anecdotes about the blazer.” From here, Carlson’s interest grew, leading him on a decade long quest to win the Regatta—a time during which he also wrote a coffee-table book called Rowing Blazers, which launched at Ralph Lauren and introduced Carlson to the men’s fashion sphere. With the deep knowledge he’d cultivated from research with his book and its subsequent success in the fashion community, the creation of his own brand of blazers was a natural next step. “First and foremost, it begins with the blazer,” Carlson says, which may seem obvious given the brand’s name, but the spirit and culture behind the piece is the true heart of the company. The blazer’s history in rowing has evolved from a practical piece of sportswear to an item worn off the water—deemed “rebelliously casual”—and into so much more. While oftentimes a brand’s association with a specific sector of culture can lead to the assumption they are targeting a particular “desired customer,” Rowing Blazers not only defies this notion, they pride themselves on their diverse client base. With Carlson’s deep passion for rowing and a desire to share it with the world, Rowing Blazers delivers a level of authenticity that isn’t common for most brands. While a part of this authenticity comes from Rowing Blazers’ collaboration with rowing teams, rugby teams, and social clubs—where they design pieces for members of these communities, providing a creative outlet for both the company and the teams—their real authenticity come from their ability to capture a truly beloved tradition and deliver it to the masses. The palpable energy behind the company can be no greater felt than at their flagship location in Soho, where customers can see for themselves how these myriad of influences come together to create a community hub. Carlson understands how that sounds. 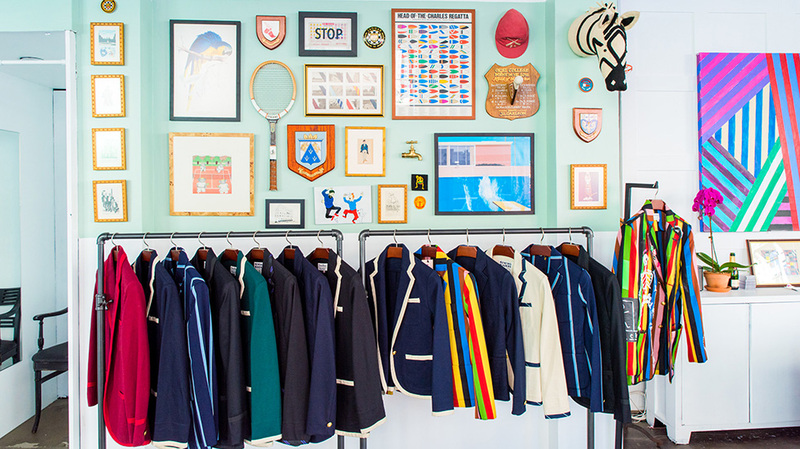 To Rowing Blazers, the monetary benefits of selling clothing isn’t nearly as important as giving customers a fresh and unique way to express themselves—one rich in history and created by a community with a contagious spirit.